Chuyen Nhac Pho Co is celebrating its special show at the Old Quarter Culture Exchange Centre, 50 Dao Duy Tu Street, from July 8 to 18. Organised by Dong Kinh Co Nhac or Traditional Vietnamese Music Group, the 10-day show of the programme, familiar to many lovers of Viet Nam’s traditional music, is a journey back to Vietnamese traditional music and culture. The event includes an exhibition that is due to take place from July 8 to18 and the performance of traditional music on the night of July 8. The exhibition features basic instruments of five Vietnamese traditional music forms, the strings of which are made of natural silk and have been restored by artist Xuan Hoach under the sponsorship of the Swiss Agency for Development and Cooperation. The show does not use any sound amplifiers, but only silk-stringed traditional musical instruments, one of the successes in the project for restoring traditional musical instruments by Dong Kinh Co Nhac. 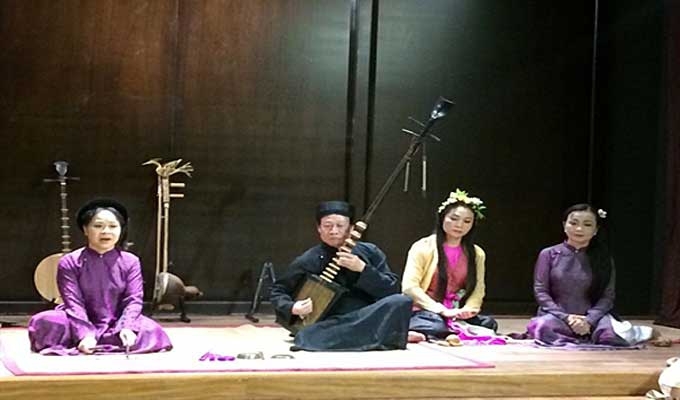 First introduced in May 2015, Chuyen Nhac Pho Co has been held monthly with the aim of providing a general introduction to the traditional and contemporary music of Viet Nam’s 1,000-year-old capital Ha Noi.